8. The Australian Opal Spray Brooch: Since opals are Australia's national gemstone, and Elizabeth II is the Queen of Australia, you'd be correct in assuming that her jewelry box included several opals. This one was one of her wedding gifts in 1947, from the Returned Sailors, Soldiers and Airmen Imperial League of Australia. It features black opals set in gold. 7. Crown Princess Mary's Opal Pendant: To mark the first birthday of Prince Christian of Denmark (an October baby! ), a Sydney-based jeweler reportedly presented the Australian-born Crown Princess Mary with an opal pendant necklace. (The gift apparently came with jewelry for Crown Prince Frederik as well: a set of opal cuff links.) I don't think Mary has ever worn this necklace in public; if she has, please point me toward pictures! 6. 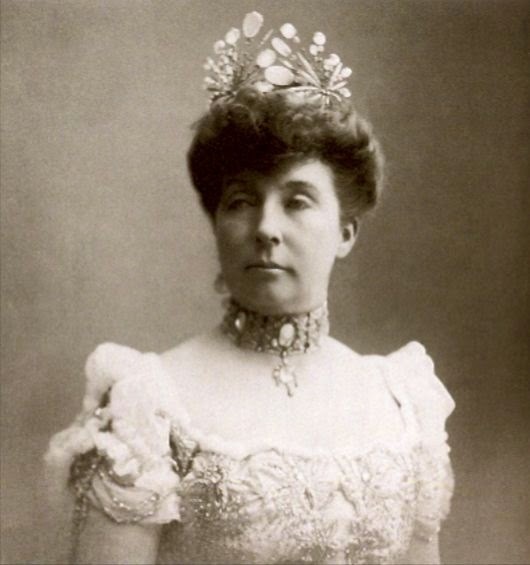 Princess Marie's Opal Parure: In the late nineteenth century, Princess Marie d'Orléans, the wife of Prince Valdemar of Denmark, owned a striking parure of jewels set with opals and moonstones. The opal tiara ended up with her son, Prince Viggo; it was substantially remade to look like a more traditional tiara and worn by his wife, Eleanor. More recently, it was worn by Viggo's daughter-in-law, the late Countess Ruth of Rosenborg. 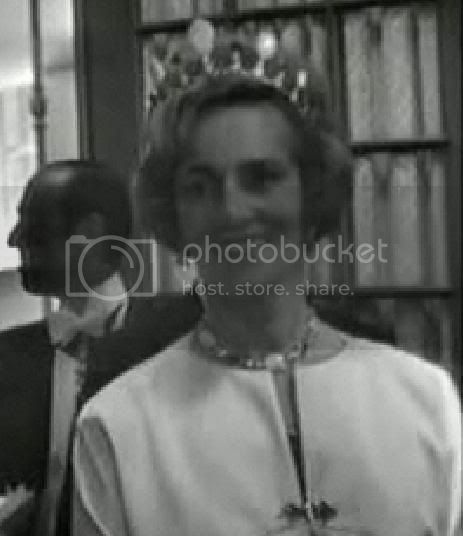 The choker that Marie wears in the portrait above is owned today by Chantal d'Orléans. 4. Queen Mercedes's Opal Ring: Just in time for Halloween, it's a cursed opal! For their wedding in 1878, King Alfonso XII and Queen Mercedes of Spain (pictured above) were given an opal ring by one of his former mistresses. The story goes that Mercedes (probably not having been clued in about the giver's former relationship with her husband) wore the ring -- and then she died. 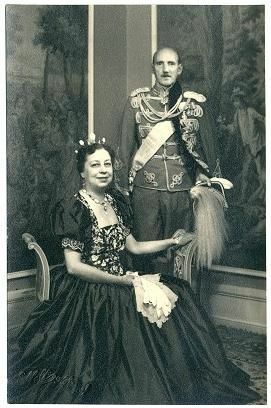 Alfonso passed along the ring to his grandmother, Queen Maria Cristina -- and then she died. Next, he gave the ring to his sister, Infanta Maria del Pilar -- and then she died. Eventually Alfonso puts the ring on himself, and you guessed it -- he died. Of course, Mercedes had typhoid fever even before her marriage, Maria Cristina was 72, and Alfonso had tuberculosis and dysentery. But maybe it's for the best that the family reportedly gave the ring to Madrid's cathedral -- you know, just in case. 3. Queen Alexandra's Opal Parure: When Princess Alexandra of Denmark married the Prince of Wales in 1863, her new mother-in-law, Queen Victoria, gave her a suite of opal and diamond jewels. The set included a cross pendant, a set of three brooches, a pair of earrings, and a bracelet (which Alexandra wore on her wedding day). The late Prince Albert had apparently drawn the designs for the set, which was made by Garrard. But Alexandra was not a fan of opals -- a novel by Sir Walter Scott had popularly depicted them as a symbol of bad luck -- and some have suggested that she had these pieces reset after Victoria's death. I'm not sure that's the case -- the sources I have aren't clear on the pieces' fates -- but either way, Alexandra's opals don't seem to be hanging about in royal hands these days. 2. The Oriental Circlet: Alexandra didn't stop her opal makeover with her own jewels -- she also had other opal pieces in the royal collection reset with Burmese rubies. Among these were Queen Victoria's Oriental Circlet, designed by Prince Albert and set with opals, one of his favorite gemstones, as well as a necklace and a pair of pendant earrings. All of these formerly-opal jewels remain with the royal family today. 1. The Andamooka Opals: During her tour of Australia in 1954 (pictured above), Queen Elizabeth II was presented with an astonishing set of opal jewels. The necklace and earrings were set with opals that had been discovered in the Andamooka opal fields; the enormous opal in the necklace weighs more than 200 carats. Elizabeth wore the set once during the tour, pairing it with Queen Mary's lover's knot tiara -- and then put it in the royal vaults. 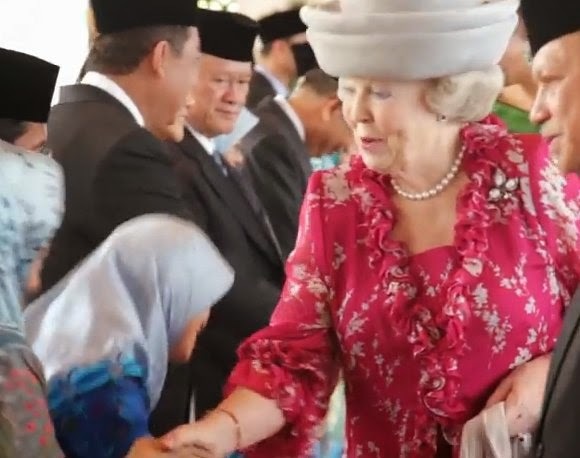 I can see that it's perhaps not to the Queen's taste -- the necklace especially is an unusual modern piece -- but surely there's someone in the family (*cough* Kate? *cough*) who could take this set out for a spin.